The idea of financial institutions and other stakeholders incorporating Environmental, Social and Governance factors (ESG) into their decision making is not a new phenomenon. In 2004, the world’s leading financial institutions were invited by the then United Nations Secretary-General Kofi Annan ‘to develop guidelines and recommendations on how to better integrate environmental, social and corporate governance issues in asset management, securities brokerage services and associated research functions’. 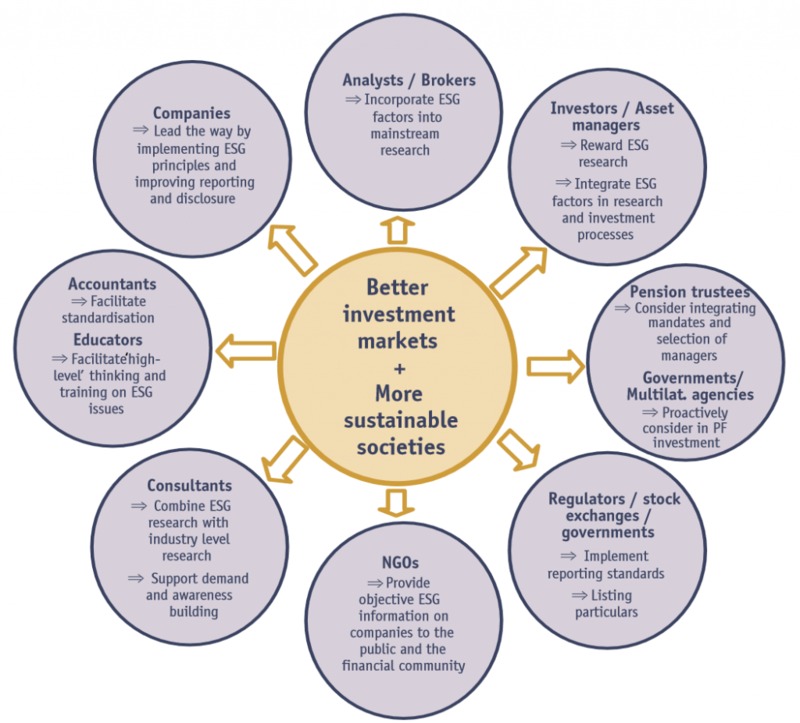 In 2005, under The Financial Sector Initiative Who Cares Wins, twenty financial firms collaborated to deliver a report – Who Cares Wins: Connecting Financial Markets to a Changing World – with their recommendations for the better integration of ESG factors. “The institutions endorsing this report are convinced that in a more globalised, interconnected and competitive world the way that environmental, social and corporate governance issues are managed is part of companies’ overall management quality needed to compete successfully. Companies that perform better with regard to these issues can increase shareholder value by, for example, properly managing risks, anticipating regulatory action or accessing new markets, while at the same time contributing to the sustainable development of the societies in which they operate. Their key recommendations are laid out in figure 1, providing a useful reminder that better investment markets and more sustainable societies will require the application of ESG by all stakeholders. First of all, it is interesting to think the report issued pre-dated the global financial collapse of 2008 and the complete erosion of trust in financial institutions, regulators and governments in general. Perhaps, if the leading financial institutions who endorsed the report had applied their own recommendation more rigorously the 2008 financial crisis could have been avoided. At the very least, if the governance issues within the financial system had been addressed sooner the real economy would not have endured such pain. While the global financial markets and the global economy have recovered, the trust that has been lost will take much longer to be rebuilt. In fact, the repercussions from this loss of trust in our institutions is most on show in the growing political divisiveness. When it comes to ESG and the broader spectrum of responsible investment this should be a reminder of the importance of ensuring that intent is matched by action. Talking about sustainability and impact is the easy part. The application is what matters. Importantly, the goals outlined in 2005 are a target the world is still reaching for despite the increased application of ESG in the corporate world and the growth of responsible investing more generally. A more sustainable future cannot be secured by simply relying on financial institutions to incorporate ESG in their decision making. A collaborative effort from all stakeholders remains fundamental to sustainable development. 2019. It is fair to say the key stakeholders – governments, companies, charities, trustees, investment consultants, advisers, trustees, investment managers, individuals and other participants in our economic system – have fallen short in terms of their responsibilities. We have seen positive developments, particularly with respect to the momentum behind responsible investing but a lot more still needs to be done to broaden awareness of our shared responsibility. We need to see all stakeholders fully integrate the Environmental, Social and Governance factors (ESG) into their respective decision making frameworks, with a focus on the long-term. Otherwise, we stand little chance of securing the sustainability of our ecosystem for future generations.